My coworker is having a baby and I could not be more excited! This coworker (let’s call him “JB”) was the first person to train me at my new job. As such, JB and I have a “complicated” relationship. Mostly it involves him trying to hate me and me trying to win his favor. I will often say “Jay-beee” around the office when I see him and it wasn’t til months later that he confided that he hates that nickname. Well too bad, JB. It’s your name! And get this – JB’s wife is also “JB” and their son–who is due in two weeks–will soon be another JB. Soooo cute. 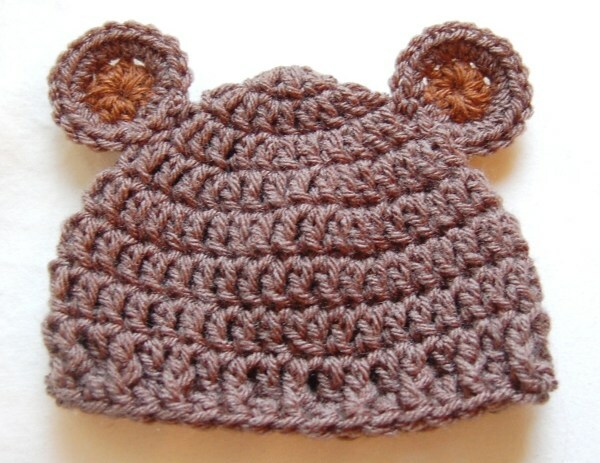 JB relentlessly kids about my crochet skills so I thought there would be no better way to finally bury the hatchet once and for all than to make his soon-to-be son a hat. And so was born (pun intended)…. 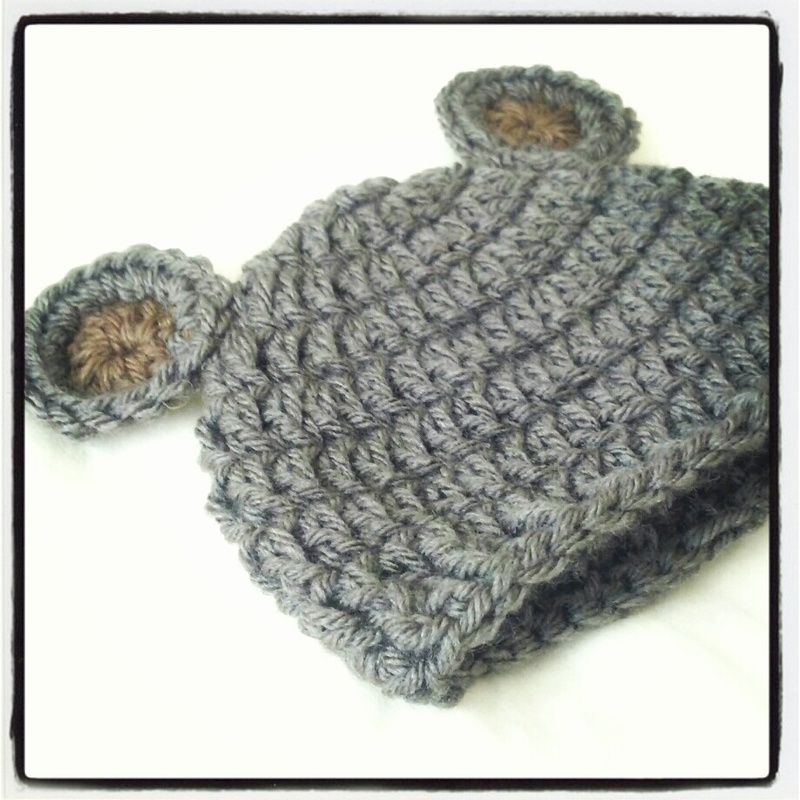 Finished Size: Hat is 6.25 inches across (12.5 inches around) and 5 inches tall (not including ears). Will fit newborn sized baby. 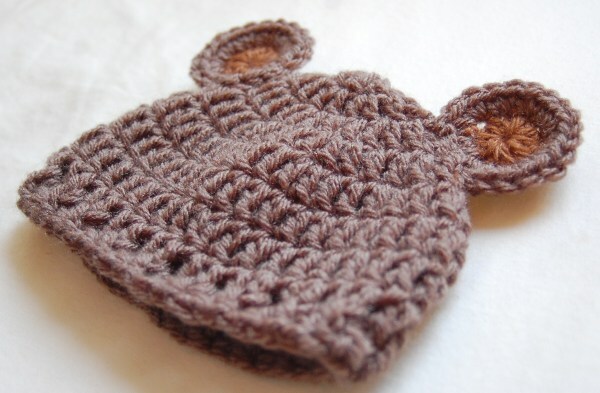 Note:**Some crocheters are reporting a small hat – Repeat Rounds 5-7 a few more times to make a hat longer. Chain 3. Join with sl st to form ring. Rounds 5-7: Dc in each st around. Join to top of ch-2 with sl st. [33 st] **Note: If you’d like a longer hat, repeat Rounds 5-7 a few more times before Round 8. Round 8: *dc in first stitch, fpdc in next stitch*. Repeat from * to * around. Join to top of ch-2 with sl st. Using darker color yarn for center of ears, Chain 3. Join with sl st to form ring. 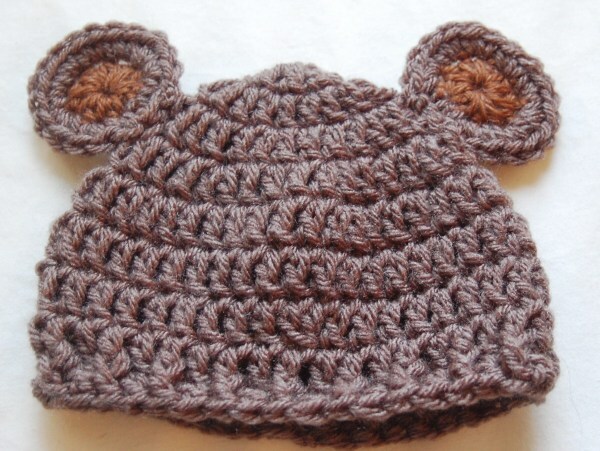 Fasten off, sew ears onto sides of hat. JB’s wife is due in two weeks so the little guy could be here anytime! I hope she makes it through the weekend so I can give JB this hat on Monday. Hold on, little guy… only two more days! What are some of your favorite patterns to make for newborn kiddos?